…well, sliced bread is a bit of a cliché, but yea, sliced bread! They’re as simple as can be. Pile up your ingredients, seal ’em up, roast, and unwrap. An incredibly healthy meal, in a flash. Oh, they sing like nothing else! 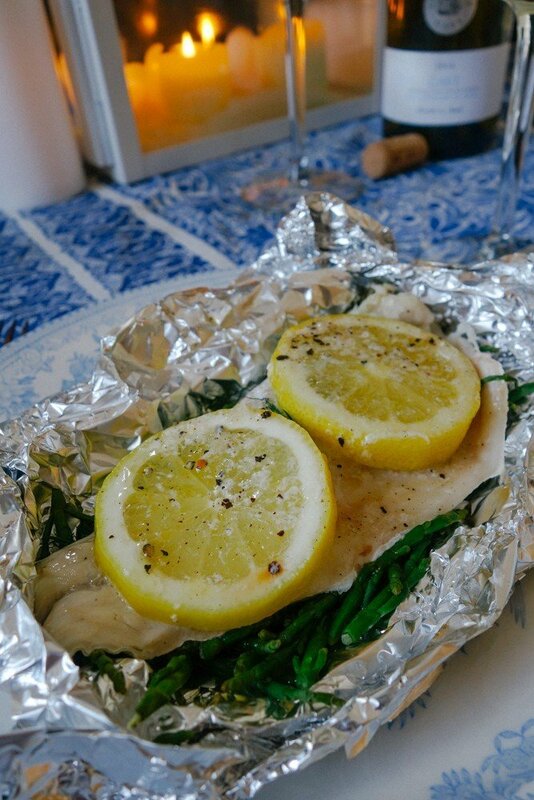 Rich, flakey fish in a river of lemon butter over a bed of greens. You can use any greens you like and any fish you like. Samphire is in season right now and just happens to be my favourite green of all. Find it at the fish counter, if you can’t see it amongst the veggies. Courgettes, spinach, asparagus, green beans, fennel, whatever you fancy would work just fine. Great when you fancy a simple supper and as easy to make for one as it is for a party of 10! When I was single I hated cooking for one, I didn’t want to waste food so would try and come up with recipes that would work well individually. This is a corker. Pre-heat your oven to 200c/390f. 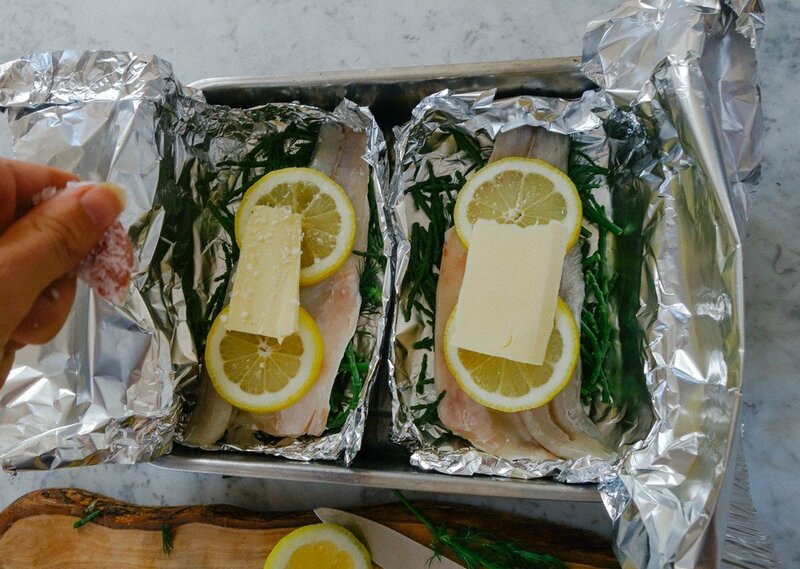 Use a rectangle of foil to make a little parcel shape and pop into a baking tray. You want some walls and a lid, like below. Place your greens in the bottom. This will steam through the fish for the most wonderfully fragrant, fresh taste. Lay your fish on top, skin side down. Top with two slices of lemon. A good sprinkle of salt. And a good couple grinds of pepper. And roast on the middle shelf for 20-30mins, depending how fierce your oven is. Add a bowl of new potatoes to the table or a hunk of bread if you really can’t live without carbs. Perfectly cooked, good work chef! No-one will be able to leave a morsel! Give it a go this week. You never know, it could become your favourite supper… any fin is possible!